As part of the Antibiotic Guardian campaign, Public Health England is hosting a Twitter chat. We hope this chat will raise awareness of the growing problem of antibiotic resistance as well as providing an opportunity to listen to the views of health professionals, or members of the public, who take part. Antibiotic resistance is one of the biggest threats facing our professions – we are set to lose some of our most precious medicines. Treatments from the most routine minor surgery to transplants and chemotherapy could become increasingly dangerous and we will enter a new era of healthcare and public health. From patients to policy makers, prescribers and health professionals in all fields, we have to act now. Are you willing to join the community of professionals who are pledging to becomeAntibiotic Guardians? 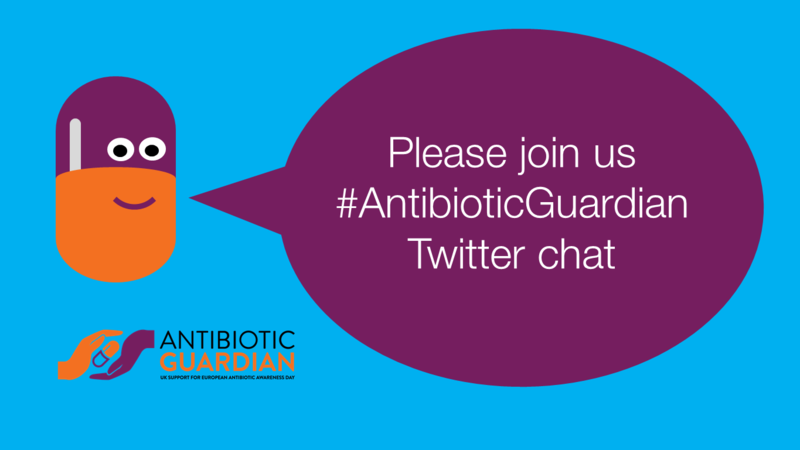 Ask questions, share your knowledge, network or just watch the discussion using the #AntibioticGuardian hashtag. During the chat we’ll flag important resources that can help you become an antibiotic guardian. The best way to take part is to actively participate, and to do this you’ll need a Twitter account. Once you have a Twitter account you can ask a question (including the hashtag in your Tweet) or you might want to respond to or comment on someone else’s Tweets through a direct reply. If you would rather watch what’s going on rather than make any comments, you can do this too. Just click on the #AntibioticGuardian hashtag during the chat and this will show you a stream of Tweets as they come through. Some people like to use online tools which make Twitter chats easier by gathering all relevant Tweets together. Why are we hosting Twitter chat? Public Health England is hosting this Twitter chat to allow health professionals to comment or ask questions about antibiotic resistance. Experts are on hand to answer questions and flag key resources, and the comments made by participants may provide useful feedback which informs future campaigns, guidance or policy. We also hope the chat will be spotted by as many Twitter users as possible, who may themselves join in or pick up useful information. What if I see someone saying something that I don’t like or that seems inaccurate? Twitter is a public forum and there is no barrier to people making comments about any topic. PHE and the panel of expert participants would not respond to any message that was felt to be abusive, repetitive or off-topic and additionally can take no responsibility for comments made by people on social media.